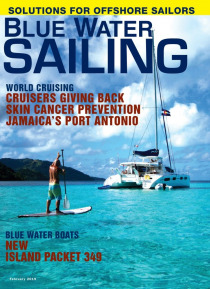 Blue Water Sailing is the leading magazine for cruisers and offshore sailors. Every issue offers readers the dream of cruising under sail in the form of real stories from around the world and how to make that dream come true. Founded by circumnavigators George and Rosa Day, BWS offers valuable insights into what the cruising life is really like, what boats and gear work (and don’t work) and wher… e to go for the best in cruising and sailing vacations. Plus, the digital version of BWS provides direct interactive access to dozens of great marine websites where you will find everything you need to make your sailing life safer and more fun.